Our youngest Westholmians supported local charity Nightsafe. This week at Westholme it is Harvest week and our youngest children from our Nursery and Infant Schools have been thinking about caring, sharing and contributing to the wider community. 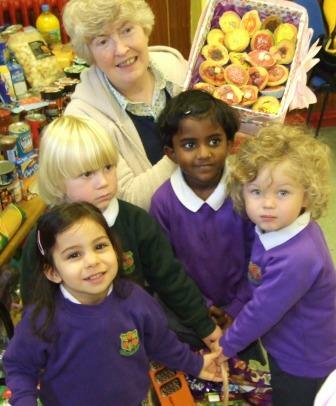 As part of their harvest celebrations, the Nursery children baked cakes to donate to Blackburn charity, Nightsafe. 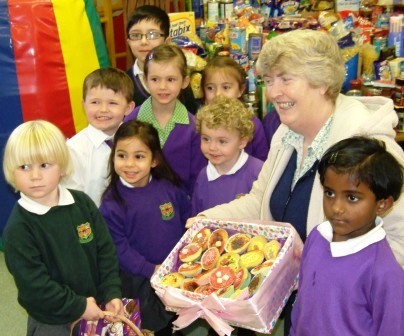 The Infant children have also donated tins, bags and boxes of food to give to the charity. Mrs Linda Sharratt, a representative from Nightsafe, visited the children to tell them all about the fantastic work Nightsafe do with homeless young people in the Blackburn and Darwen area and to thank them for their special gifts. The Nursery children travelled down to the Infant School in their turtle buggy and helped their older friends at Billinge House entertain her with their harvest festival assembly before presenting her with their donations.